Softcover, 7 3/4 x 10 3/4 in. 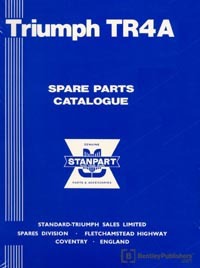 This Triumph Parts Catalog contains parts diagrams and illustrations for TR4A models, and contains comprehensive system coverage including engine, transmission, steering, brakes, ventilation and many more. Triumph part numbers and abbreviations are also listed. This Triumph parts information is helpful when performing Triumph repairs and Triumph maintenance. Also available are the companion Triumph TR4 & TR4A Workshop Manual: 1961-1968 and Triumph TR4A Driver's Handbook: 1965-67.